Making sense of all the different varieties of chicken feed can be very confusing for first time and even semi-experienced chicken keepers. “Mash”, “grower feed”, “medicated or unmedicated”, there is so much jargon on the chicken menu it can genuinely be quite overwhelming. 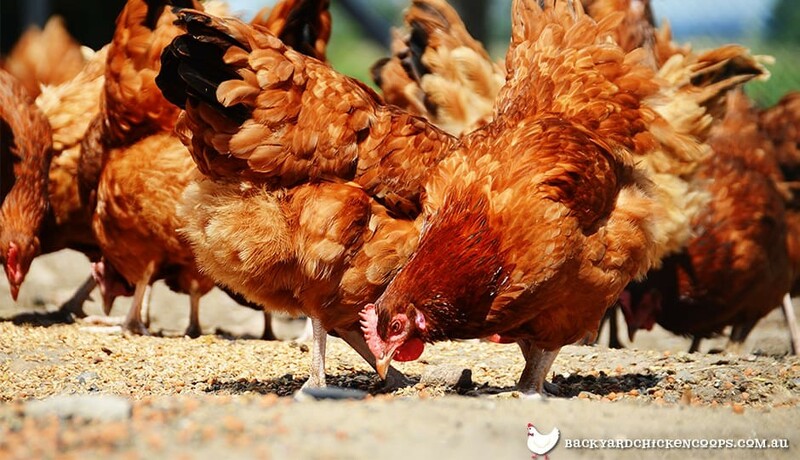 That’s why the Backyard Chicken Coops team have created this comprehensive glossary that will help you make sense of all the curious culinary chicken feed concepts. Starter feed is a protein dense variety of chicken feed designed to meet the dietary requirements of baby chicks. Generally speaking baby chicks can live comfortably on a diet of starter feed and water for the first 6 weeks of their life before progressing onto grower feed. The high protein content, usually between 20-24%, helps young chicks grow into playful pullets, however it’s imperative that you phase out the starter feed once they are 6 weeks old, otherwise the excess protein can cause liver damage. 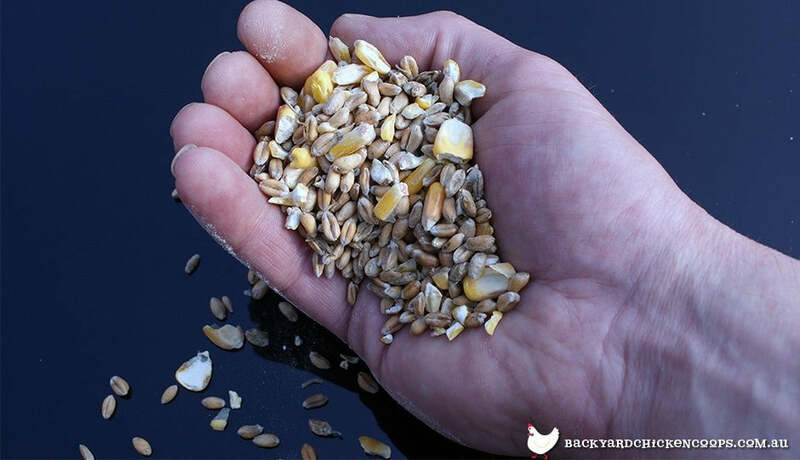 To complicate matters, there are varieties of feed known as starter/grower feed, which is essentially a type of feed that chickens can eat from 1-20 weeks of age. But always read the label and consult the nearest poultry guru if you have any doubts. For more information about what to feed baby chicks, simply click here. Grower feed in many ways is like chicken feed for teenage chooks. The dietary requirements for a chicken between 6 to 20 weeks old is very different from a baby chick. Essentially grower feed contains a protein content that is between 16-18% but has less calcium than regular layer feed. In an egg shell, grower feed supports the continuing growth of your teenage chookies without bombarding them with unnecessary vitamins and minerals that are more suited for fully grown laying hens. Once your girls start laying eggs that’s a good sign that they are ready for layer feed. To get the lowdown on when you should expect the first eggs from your pullets, make sure you have a sticky beak at this eggcellent article here. For most of your flock’s life their diet will predominantly consist of scrumptious layer feed. Layer feed has an ingenious balance of protein, calcium and other vitamins and minerals that encourages top tier egg laying abilities in your flock. Protein wise layer feed contains similar levels of protein to grower feed, around 16-18%, however has extra calcium to ensure that their eggshells are crisp, clean and crunchy. Feeding layer feed to baby chicks or young pullets however will not meet their unique dietary requirements. Layer feed should only be fed to chickens around 20 weeks of age or once they have started to lay eggs. If you’ve been trying to cook up new strategies to get more eggs from your laying hens then you definitely need to give this handy article a quick read here. To put it simply mash is a loose and unprocessed version of chicken feed. Similar to the texture of potting soil, mash is the finest variety of chicken feed commonly available. Mash is normally used for baby chickens, as it is easy to digest, however it is not uncommon for fully mature chooks to be fed mash. Some Chicken Ladies or Lads combine mash with hot water to create a porridge like texture that your flock will love to chow down on. Be mindful however of the fact that this method can cause the feed to expire more quickly. The main issue with mash varieties of chicken feed is that its texture often results in an increase of incidental waste, so bare that in mind. In simple terms crumble is a coarse variety of mash but not as compact of pellets. Reminiscent of the texture of oatmeal, crumble is a semi-loose variety of chicken feed that is slightly easier to manage than mash. Some chicken lovers use crumble to bridge the gap between mash and pellets for their flock. Others claim that their girls just simply prefer the crumbly texture. Whatever your reasons for using crumble instead of mash or pellets at the end of the day it shouldn’t make any significant difference to your flock’s health. Pellets are perhaps the most common variety of chicken feed available. 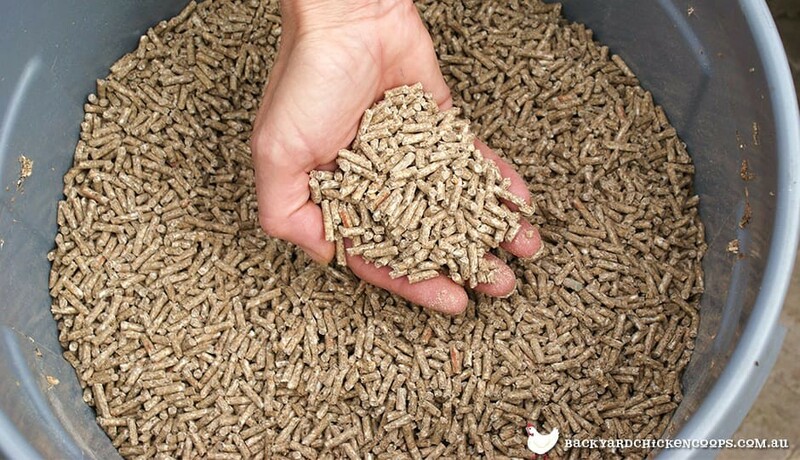 Just like it sounds pellets are essentially little compact cylinders of chicken feed goodness. One of the benefits of using pellets is that they hold their shape nicle, which means they won’t go to waste if your ladies accidentally knock their feeder over. Easy to manage, store and serve, pellets often become the first choice for most backyard chicken keepers. Some first time poultry keepers aren’t aware of the importance of shell grit in their flock’s diet. Shell grit essentially serves two key purposes. Firstly, shell grit is a rich source of calcium that helps your ladies form delicious eggs with strong and sturdy shells. Chooks that don’t get enough shell grit in their diet can end up laying a wide variety of egg oddities that could turn even the most dedicated of chicken lovers off their eggcellent bounty. Secondly, chickens store shell grit in their gizzard, which assists them in pulverising their feed to help them digest their dindins with ease. All mature chickens need shell grit in their diet and it should be served in a separate dish from their regular laying feed. Chickens are able to regulate their calcium intake so don’t fret about serving sizes too much - most girls will be able to tell when they’ve had enough. To find out more about the advantages of shell grit, just click here. Chicken scratch is not the same as chicken feed. Try and imagine chicken scratch as a kind of treat for your flock. Most chicken scratch varieties consist mostly of cracked corn and other grains that chooks love to eat but are unfortunately not very good their waistlines. Chicken scratch is a great source of energy for your flock and can also help warm their bellies on chilly winter nights. However, always remember that chicken scratch is not the cornerstone of a health diet - it is a delicious treat that every chook should enjoy every now and then. Medicated chicken feed is common amongst starter and grower varieties as it is an easy way to help prevent coccidiosis and other fowl diseases in your flock. Simply put, medicated feed contains amprolium which is a chemical that helps protect your girls from dangerous and deadly diseases that they can catch when young. This being said, do not use medicated feed if your chooks have been vaccinated, as the effects of the amprolium are not compatible with the vaccination. Fermenting your chicken feed is an easy way to improve its vitamin and enzyme content of their food, as well as making the feed easier to digest for your chooks, while also neutralizing toxicity. Another benefit of fermented feed is that due to its density it helps your chickens feel fuller for longer. That means the weekly cost of chicken feed will decrease and your chickens will also do fewer droppings - EGGCELLENT! 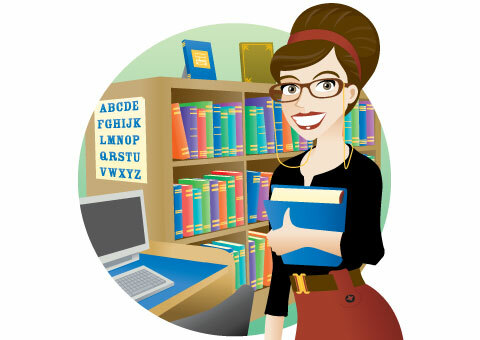 If you want to find out more about fermenting your own chicken feed, simply click here. Broiler varieties of chicken feed are available for people who are raising chickens for consumption. Without dwelling on the specifics too much there are 3 key varieties: starter, grower and finisher. Essentially, broiler varieties of chicken feed are denser in protein, which encourages the flock to grow bigger, faster. It is definitely not encouraged to feed your laying hens broiler varieties of chicken feed, as the excess protein is not always beneficial to your flock’s health. Discover more natural ways to boost the protein in your flock’s diet by clicking here. Make sure you print this page off or save it to your phone before you next head into your local poultry store to help make sense of all the different varieties of chicken feeds on offer. No matter what types of feed are best suited to your current flock, the important thing to remember is that chickens with personality need a coop with character. Make sure you have a sticky beak at our terrific Taj Mahal, our perfect Penthouse and our magnificent Mansion, all of which are perfect for chickens of all shapes and sizes.